Sorry folks. The snow won, and tonight's event--described below--is being postponed. Our sincere apologies, and new date to be posted very soon. In an eventful and successful career spanning 40 years, Dr. Robert White–pioneering neurosurgeon and Professor at Cleveland’s Case Western Reserve University–did many things. He participated in Nobel Prize-nominated work, published more than 700 scholarly articles, examined Vladimir Lenin’s preserved brain in Cold War Russia, founded Pope John Paul II’s Committee on Bioethics, went to mass daily, and raised 10 children. He also engaged in a series of horrifying and highly controversial experiments reminiscent of a B-Movie mad scientist, experiments which pushed the limits of medical ethics, infuriated the animal rights community, and questioned notions of identity, consciousness, and corporeality as well as mankind’s biblically-condoned dominion over the animal kingdom. Tonight, join film-maker Jim Fields–best known for his 2003 documentary “End of the Century” about the legendary punk band The Ramones–and Mike Lewi for a screening of Fields’ short documentary about the life and work of this real-life Dr. Frankenstein whose chilling “full body transplants” truly seem the stuff of a B-Movie terror. Fields will introduce the film–which features a series of interviews with Dr. White discussing his controversial experiments–with an illustrated lecture contextualizing the doctor’s work within the history of “mad scientists” past and present, fictional and actual; scientists whose hubris drove them to go rogue by tampering with things perhaps best left alone. Jim Fields made a few documentaries, one of which, “End of the Century: the Story of the Ramones” is particularly long. He’s currently a video journalist at Time Magazine and Time.com. Mike Lewi is a filmmaker, event producer, and disc jockey. You can find out more about this event on the Observatory website by clicking here and can can access the event on Facebook here. You can get directions to Observatory--which is next door to the Morbid Anatomy Library (more on that here)--by clicking here. You can find out more about Observatory here, join our mailing list by clicking here, and join us on Facebook by clicking here. 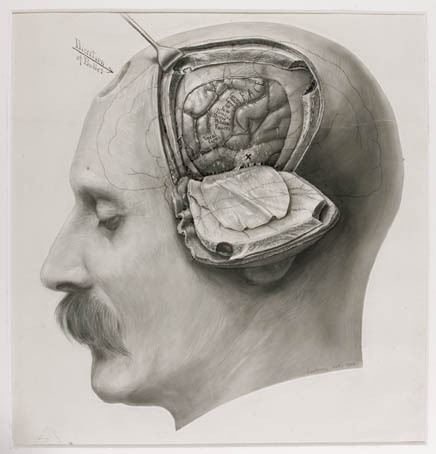 Image: Drawing by Dr. Harvey Cushing, early 20th Century, found on the Yale Medical Library website.